The cyclamen plant is a tubular that is native to the Greek Islands of Turkey and some parts of Europe. They can also be called Persian violet and Sowbread. These plants are loved for their long-lasting pastel flowers and their beautiful dark green heart-shaped foliage. There are 23 different species of cyclamen plants, and they are part of the Primulaceae family. 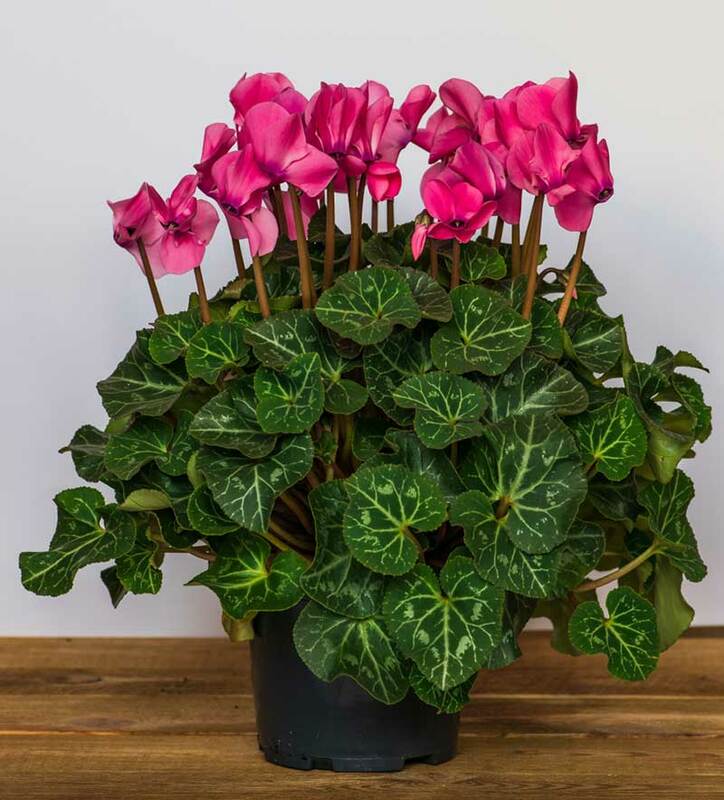 While they can be grown outside in zones 7 and above,cyclamen are often used as a houseplant throughout the world. If you are thinking about getting a cyclamen plant, then here are some tips to keep your plant healthy and thriving. Most Cyclamen plants that are loved in todays day and age are hybrids of the originals that were grown as early as 1735. While growers back then had to carefully tend to their plants for up to five years hoping to get blooms for two months, they are much easier to grow today. Cyclamen plants tolerate a variety of soils as long as they are well drained. They prefer a slightly acidic soil. If you are not sure of your soil’s pH levels, then start with a soil test kit. If you need to raise the acidic level for the cyclamen before planting outside, then mix a little organic matter into the soil. If you are growing the cyclamen plant indoors, then you also need acidic soil. A great way to do this is to add sphagnum peat to the soil. When you are potting the plant, fill the bottom with regular potting mix, but then mix sphagnum peat into the top two or three inches of soil. If you are growing the cyclamen plant outdoors, then keep them in a shady spot. It is best to keep them in their pots in a space where they will not get direct sun. A north window is ideal for your cyclamen plant. The pot should get some indirect sun. Avoid putting them in any window where the temperature gets to high. Your cyclamen plant needs to be kept above 50 degrees whether you grow it inside or out. They also dislike temperatures higher than 68 degrees. 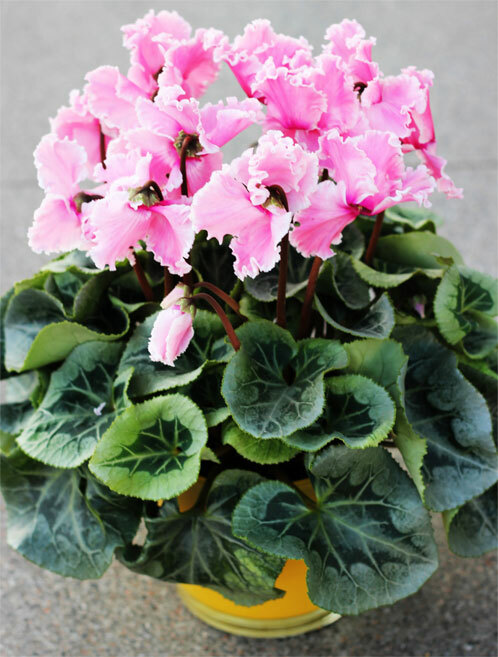 Maintaining the proper humidity level is essential if you want the cyclamen plant to bloom. This is especially crucial when humidity levels often drop with winter heating. You may want to run a humidifier near your plant or grow it in an indoor miniature greenhouse to ensure that there is enough moisture in the air. Alternatively, keep an indoor humidity monitor near the plant which helps ensure that you remember to check the plant’s humidity level often. Cyclamen plants dislike getting too wet or too dry. If you tend to overwater your plants, then consider using African violet potting soil as it drains better than normal potting soil. Whether you are growing the plant inside or outside in a pot, it is vital that the plant does not sit in water. It can cause the plant’s tubes to rot, ending up killing the plant. For outside plants, turn the pot on its side if rain is in the forecast. Overwatering can kill cyclamen plants, so a great tip would be to grow your plant in a self-watering pot. Fill the bottom of the pot with water. Then, sit the plant in it. The pot containing your plant will soak in water as needed. Alternatively, you can use a soil moisture gauge so that you know when the perfect time to water your plant. If you often underwater your plants, consider growing them in a mixture of peat moss or vermiculite. These mediums hold water better than other alternatives. This plant also does not like to get its leaves or flowers wet. Therefore, you need to water it from the bottom. Fill a plant tray, then sit the pot in the water for a few minutes. Then, allow the soil to get dry before watering again. Most cyclamen plants need a very weak 20-20-20 or 10-10-10 fertilizer. Keep an eye on the leaves, and if they have a yellow color, then your plant needs more iron. Once the plant goes dormant, usually in April, then you do not need to fertilize the plant again. When you notice the first buds appear on your plant, then give it a dose of fertilizer high in phosphorus to encourage blooming and to help the blooms stay longer. If you want to repot your cyclamen plants, then choose a pot that is no larger than one inch bigger than the one it is in. The best time to repot them is while they are dormant. This usually happens between April and November. Your watering tendencies determine the soil mixture that is best for cyclamen plants. If you tend to overwater, then consider using an African violet potting soil. If you tend to underwater, consider mixing regular potting soil with peat moss or vermiculite. Start by filling the pot about halfway full. Then, carefully remove the tubular from its former home. Add the plant to the new pot at the same depth as it was in the old one. These plants dislike being deeply buried. Instead, they prefer for the top of their tube to be sitting at the top of the soil or just a little above. Cyclamen plants generally bloom between December and April when other plants are dormant. This makes them a great choice for many homes during the holidays. Shortly after the plant blooms, you will notice the flowers drop followed by the leaves. Your plant is not sick. Instead, it is going into dormancy. Eventually, the plant will die back until it is just the roots. You can help the process along by removing dead leaves and flowers. Once all the leaves are gone, place the pot in a cool dark space for two to three months. Then, give the plant a very good soaking. Allow the plant to completely drain. Do not water it again until you see it growing. Then, return to your normal watering and fertilizing routine. If you look under your cyclamen plant, then you will see little pods. These pods contain seeds. Wait for the pods to dry naturally releasing the seeds. Then, soak the seeds for 24 hours in water. Remove the seeds from the water and plant in a soil-starter mixture. Plant the seeds at least two inches deep and water. While it may appear that nothing is happening, your new cyclamen plant is growing the tube it needs before it breaks through the ground. 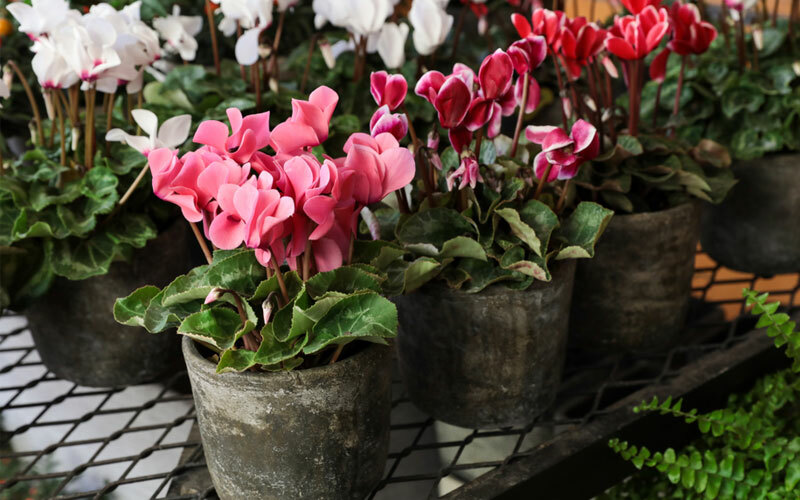 The key to keeping your cyclamen plant blooming longer is to cut back stems where the flower has already bloomed. Sometimes, you will see pods on the stems you are cutting back. These pods should be removed as well because they are not the pods you want to propagate your plant. 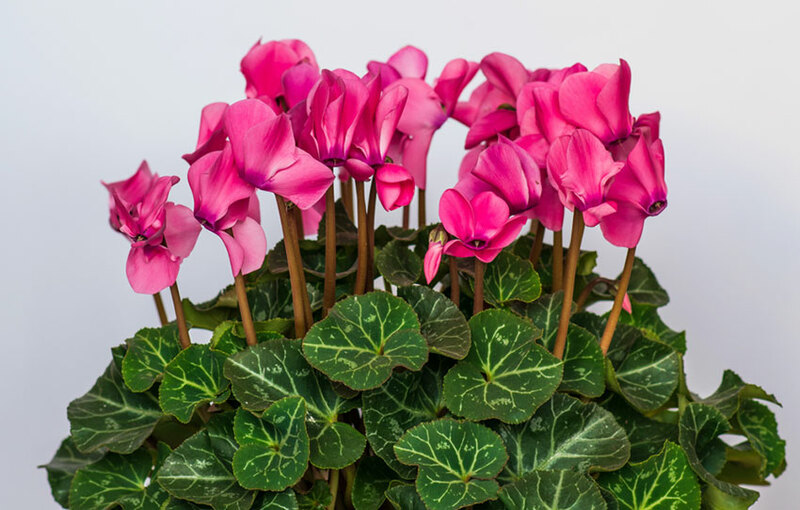 Additionally, remove any dead leaves from the plant, and your cyclamen will keep blooming for a long time. Bacterial soft rot and Fusarium wilt – Unfortunately, this disease cannot be cured, but there are two important keys to preventing it in the first place. Always use clean soil for planting or repotting these plants. Always sanitize your pots if you are reusing them. Botrytis blight – The first sign that your plant has this problem is that the leaves will look wet. Then, you will see tan spots on the leaves. This disease is contagious, so isolate the plant. Additionally, put a fan blowing on the plant so it gets plenty of air. Leaf spot – If your plant’s leaves have spots on them that are not tan, see if they have a black dot in the middle. If they do, you have leaf rot. The plant should be isolated to avoid the diseases spread. Water from the bottom to avoid this problem. Are they Poisonous to Pets?